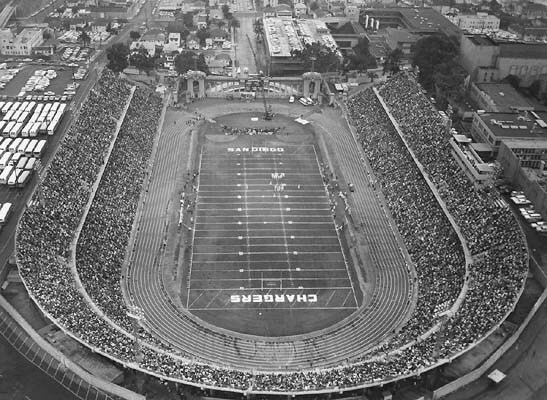 San Diego’s Balboa Stadium formed a classic horseshoe design in 1965 when it was home to the AFL San Diego Chargers. Today the place has shrunk in size and import as home to the San Diego High School Cavers. Back in 1965 Balboa Stadium also hosted the AAU Track & Field Championships, the highlight of which was the one mile run, featuring New Zealand’s Peter Snell and Czechoslovakia’s Josef Odložil, the Olympic gold and silver medalists from Tokyo 1964. Joining them in the field was the newly-minted American mile record holder, Jim Grelle, a product of Bill Bowerman’s University of Oregon program, and one other notable worth mentioning, a gangly high school senior out of Wichita East High School in Kansas, one Jim Ryun. 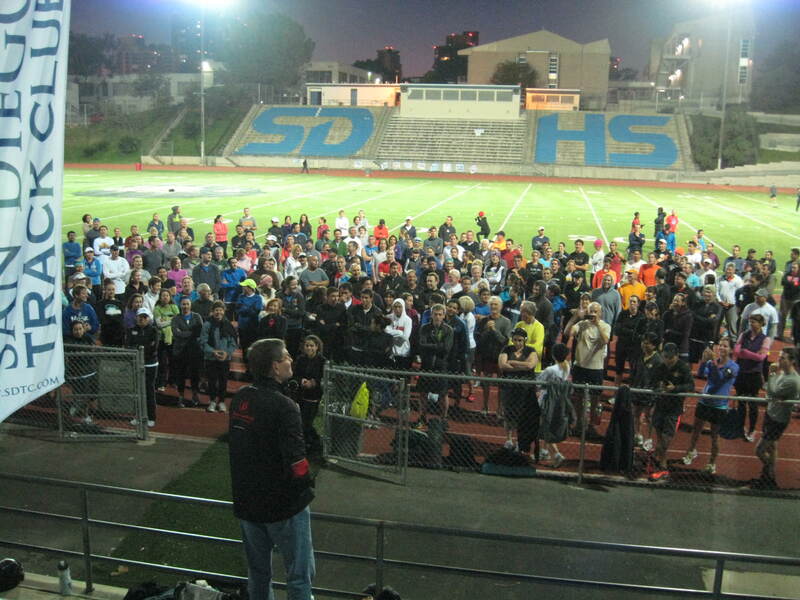 Last night an only slightly less gangly Jim Ryun stepped back into Balboa Stadium for the first time in 48 years to address members of the San Diego Track Club just before their weekly workout. After his remarks and the surge of autographs and photos had slowed, Jim stood and recalled the night in 1965 that still stands as the most legendary that any U.S. high school athlete in track ever created. Ryun remembers an electric crowd of around 20,000 that night in a stadium which held 34,000. ABC’s Wide World of Sports covered the meet live with Bill Fleming and Jim Beatty on the call. “Generally in a national championship you’d run for places,” explained Ryun. “In our case top three went overseas, so most of the time you find a tactical race. But it began to develop early on as a fast race. At 600 yards to the finish the Olympic silver medalist Josef Odložil from Czechoslovakia took off. He broke the race open. We ran sixty; two-minutes; right at three minutes (splits) and he carried it through three-quarters. Back then it was a center-of-the-track start and finish, and with little less than a quarter to go Odložil began to fall apart. Ryun’s winning time, 3:55.3, was not only the American high school record, a time which would stand for 36 years until Alan Webb broke it at Hayward Field in 2001, but it also broke the open American mile record, as well, besting the mark Jim Grelle had set nine days before in Vancouver, British Columbia (3:55.4). Remember, too, that the world mile record in 1965 was 3:53.6, set by France’s Michel Jazy. As great a run as Alan Webb had at the Pre Classic in 2001, 3:53.43, he finished in fourth place and was four seconds behind Morocco’s Hicham El Guerrouj who ran the first sub-3:50 mile on U.S. soil at 3:49.92. Ryun won the national championship, sans pacers, a day after a qualifying race, against the reigning Olympic gold and silver medalists in an overall American record time. That performance still remains hard to fully comprehend. Of course, Ryun went on to more world records, stunning marks that stood for many years. He also suffered tragic losses. Not so much the silver medal — which he brought with him and wife Anne last night to Balboa Stadium – when Kenya’s Kip Keino took gold in the altitude of Mexico City off a torrid early pace. Ryun’s performance there was among his best, considering the quality of Keino and the times they ran at 7350 feet (3:34.9 and 3:37.8 ). No, the real tragedy took place at the Olympics of grand tragedy, Munich `72 when those Israeli athletes were murdered by Black September terrorists. In his semi-final heat of the 1500 Ryun was tripped, fell, and never regained contact with the pack. A protest by the American officials to reinstate Jim into the final was denied. Though he would continue competing, even trying to ignite a professional track circuit in the mid-1970s called the International Track Association, for most the Munich Games marked the end of what remains one of America’s most storied track careers. Today, Jim Ryun and his wife Anne still live in Washington D.C. where Jim served from 1996-2007 as a congressman representing the 2nd District of his native Kansas. He also continues with his running camps, which he is expanding to San Diego this summer at the University of California, San Diego from June 23-28. Go to ryunrunning.com for details. On September 21, 1927, Charles Lindbergh visited San Diego, where his Spirit of St. Louis airplane had been built. He was given a hero’s welcome at Balboa Stadium. With over 60,000 in attendance Lindbergh performed a low-level fly over at 100 feet, dipped his aircraft’s wings and circled the stadium eight times. After landing he was paraded through the city to the stadium where the crowd had to be held back by 650 Marines. The 20th Century was a time of heroes. Balboa Stadium saw its share. Few flew higher than Jim Ryun in 1965. 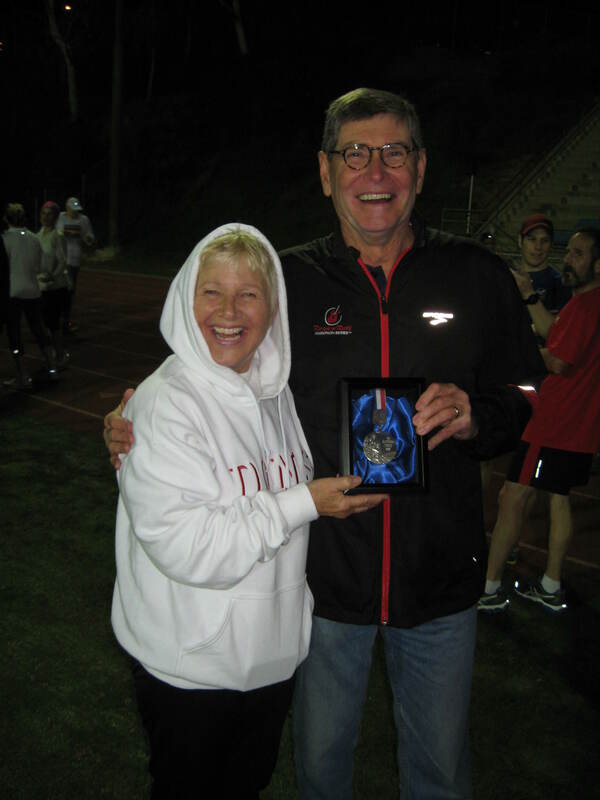 Historical note: Jim Ryun also set an indoor mile world record in San Diego. Feb. 19, 1971 in the Sports Arena Jim ran 3:56.4. Where did you get the photo of Balboa Stadium? I was at that historic meet, as a ten year old, with my Dad, a high school track coach in Illinois, and I still remember parts of it and brag about it regularly. That meet is one of the events of my youth that made me a track fan for life. We also got to see Mills/Lindgren battle in a fantastic race. What a fantastic experience! It is those kinds of experiences which can set the hook in a kid to become a life-long fan. That’s what we need to re-develop. Thanks for reading.